Rosacea is a kind of skin condition that makes blood vessels visible at the surface of the skin and causes redness. It’s not a dangerous condition, but it can be uncomfortable and unsightly. Having rosacea can really lower your aging relative’s self-esteem. Rosacea can be treated, though, making symptoms less noticeable and help your loved one feel better. Having light skin, especially if the skin has been damaged by the sun. Being over the age of 30. Having a family member with rosacea. Some people think rosacea happens because a person doesn’t keep their skin clean, but that isn’t true. Very hot or cold temperatures. Medications that cause dilation in blood vessels, such as some medicines used for blood pressure. Redness: The center part of the face appears red. Blood vessels at the surface of the skin on the cheeks and nose become inflamed and are visible through the skin. Pimples: Sometimes rosacea causes pimple-like red bumps on the face. They may or may not contain pus. They can make the face feel warm to the touch and sore. Eye Issues: Some people with rosacea also have trouble with their eyes. The eyelids may be red and swollen, eyes might feel dry, or they could feel irritated. Bulbous Nose: In rare cases, rosacea can cause the skin on the nose to get thicker, making the nose look bulbous. This happens more in men than in women. Elderly care providers can help seniors to make some lifestyle changes at home that can reduce the symptoms of rosacea. 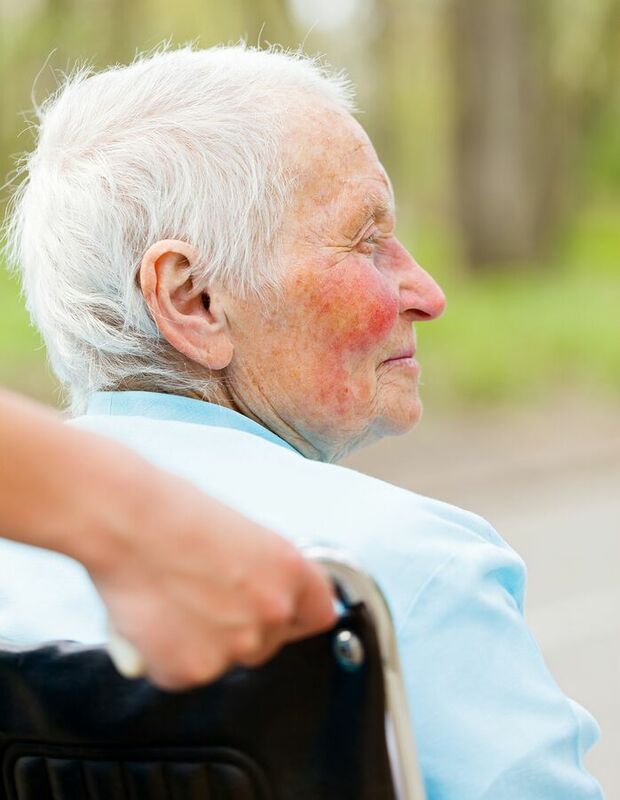 Elderly care providers can help them to avoid rosacea triggers. Since protecting the skin on the face can relieve rosacea or keep it from getting worse, seniors should take steps before going outside. An elderly care provider can help the older adult to apply sunscreen and remind them to wear a hat or scarf, depending on the weather.